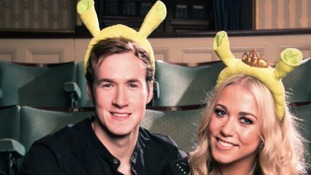 Shrek The Musical is to make a return to the Sunderland Empire theatre as part of a new nationwide tour. A uniquely adapted version of the West End family favourite, Shrek The Musical, will be playing for one special performance at Newcastle Theatre Royal. Relaxed performances are specifically designed to welcome people with an Autistic Spectrum Condition, learning disability or sensory and communication disorder into the Theatre. They have a less formal, more supportive atmosphere in order to reduce anxiety levels and chill out zones are provided for any audience members feeling anxious. He may be green, smelly and occasionally rather fearsome.....but swamp-dwelling ogre Shrek has travelled from far, far away to be the guest of honour at Eldon Square today. The well-loved giant will switch on this year's lights at the Newcastle mall later afternoon. The display will include more than 100,000 lights to mark the start of the festive shopping season. Shrek, portrayed by actor Dean Chisnall will appear at the city's Theatre Royal in Shrek The Musical next year but has taken time out from rehearsals to bring some Christmas cheer. "I am honoured to be invited to turn the Christmas lights on in intu Eldon Square. I have been told that this is usually a job for soap stars and boy or girl band members so I'm very pleased that the organisers recognise my own musical talent and boyish good looks! I will probably take the opportunity to do a bit of Christmas shopping while I'm here and also a bit of a recce so I can report back to the Fairytale Misfits about the sights and sounds of the city ahead of our arrival with Shrek The Musical next March"
"We're absolutely thrilled that Shrek has taken time out from performing in his tour of the UK and Ireland in this hit musical to visit us in Newcastle prior to arriving at Newcastle 's Theatre Royal next year. This year's Christmas Lights Switch On will be very special indeed, with a brand new scheme of lights waiting for our Shrek-tacular guest to bring them to life. The lights switch on always signals the beginning of our very busy Christmas shopping period, so if Shrek needs some advice on gifts for Princess Fiona - we're here to help!" Shrek the Musical will head to Newcastle's Theatre Royal as part of the show's first national UK tour. Shrek and Donkey will take to the stage 11 - 29 March 2015. It has already been seen by almost a million people in London.